June 19, was Dr. Jose Rizal's 151st birthday. It was actually yesterday, so to honor him being our National Hero, and the primary mover of Philippine Independence, restaurants and hotels have joined together in a project. Since we are talking about Rizal and his passion for Filipino cuisine, have you ever wondered what his favorite dish or viand and even what snack he might have taken during the arising of propaganda for the foreign invasions? Bacolod Chicken Inasal, one of the country's well known Filipino restaurants, in a joint project with the Department of Tourism's Kulinarya Kalayaan and together with the Hotel and Restaurant Association of the Philippines invites all Filipinos to celebrate and EAT LIKE A HERO. Eat Like A Hero is the newest meal offering at all Bacolod Chicken Inasal restaurants nationwide that features the favorite meals of our national hero Jose Rizal as inspired by his letters to his family while he was in Paris and in exile in Dapitan. 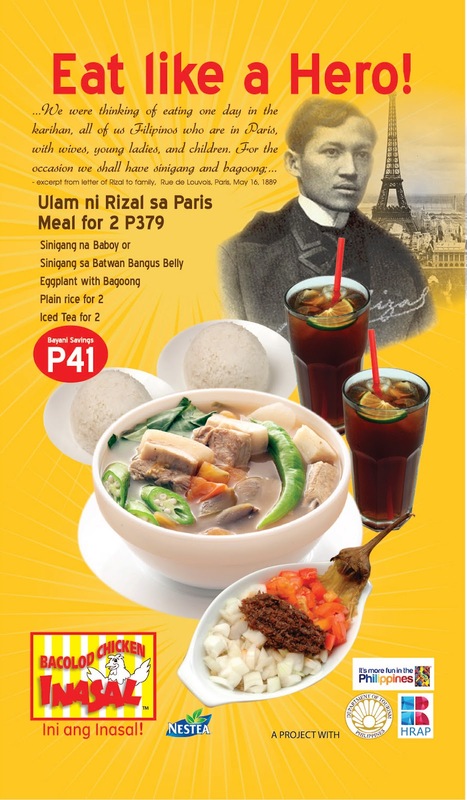 "Ulam ni Rizal sa Paris", the title of the first meal offering, is inspired by excerpts from Rizal's letter to his family while in Paris on May 16, 1869 where he wrote, "We were thinking of eating in the karihan, all of us Filipinos who are in Paris, with wives, young ladies and children. For the occasion we shall have sinigang and bagoong..." Touched by Rizal's longing for his native sinigang and bagoong while being far away in Paris, "Ulam ni Rizal sa Paris" features a choice of Sinigang na Baboy or Sinigang sa Batwan Bangus Belly served with a side dish of grilled eggplant, tomato and onions with bagoong, plain rice and iced tea, a feast for two persons for only P379. Purchase of this meal will provide diners with "Bayani Savings" of P41. Both Sinigang na Baboy and Sinigang sa Batwan Bangus Belly are bestsellers of the restaurant chain. BCI's big bowl of classic Sinigang na Baboy guarantees tender soft bite cuts of pork belly soured by a tamarind based broth with native vegetables. The chain's Sinigang sa Batwan Bangus Belly provides diners with something unique and extra special as the soup broth is soured by the rare Visayan souring agent called "batwan" that grows wild and found only in the countryside of the Visayas. "Batwan" gives the premium cut bangus belly sinigang broth a special delicate flavor truly a rare treat available only at BCI branches. Who would not succumb to the sour tamarind soup based ultimate "Pinoy Ulam" (Philippine viand)? Cut pork bellies are slow cooked till tender and the liquid base made salivatingly sour with tamarind paste, with all the Pinoy veegies that is indigenous to our country, like kangkong, eggplant, long green chilly, and tomatoes. The batwan, the souring agent for the Sinigang na Bangus. Inspired by a letter of Rizal to his sister while on exile in Dapitan, the other EAT LIKE A HERO meal offers diners a chance to experience a merienda that we imagine Rizal would have been served as his typical snack by his lady companion whom he calls "Ms B" in Dapitan. 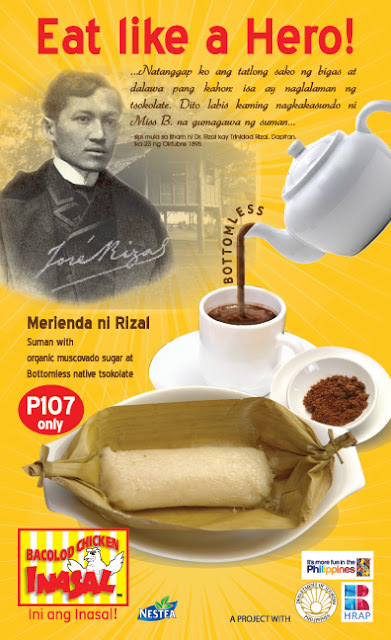 Rizal wrote to Trinidad Rizal from Dapitan on October 23, 1895 in Filipino "Natanggap ko ang tatlong sako ng bigas at dalawa pang kahon: isa ay naglalaman ng tsokolate... Dito labis kaming nagkakasundo ni Ms. B na gumagawa ng suman." BCI's meal coined as "Merienda ni Rizal" offers a traditional Filipino snack of specially made delicious suman served with organic muscovado sugar and with one of the best tasting native "tsokolate" served bottomless for only P107. From Rizal's letter, it is easy to imagine Ms. Josephine Bracken, the lady that Rizal calls as "Ms B", painstakingly preparing for our hero the most delicious tasting suman and Rizal enjoying that with a cup of real cacao-made chocolate – a snack truly fit for a hero! Today, the Filipino people that Rizal loved and died for, can share the same love for good Filipino food and for our country by dining like a true Filipino hero with Bacolod Chicken Inasal's Eat Like A Hero meals. Thanks to the sisters behind it! For any questions, please feel free to contact Ms. Rose Meim at 09178927262. Salamat gid! I love, love, love suman! Now I know where to get one, plus I get to eat like a hero, too. That is cool! It was nice to have finally met you last Tuesday. See you again soon!